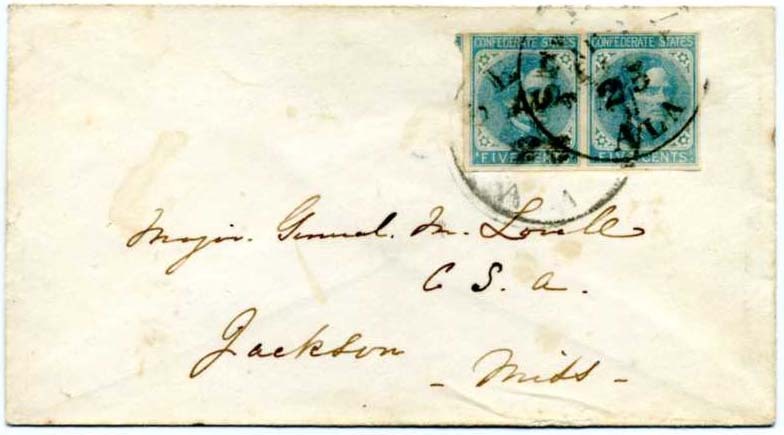 CSA 7, 5¢ blue bottom sheet margin copy on London Paper, pre-use crease, tied indistinct cds on homemade cover, interesting printing flaw in margin between the stamps at top $160. 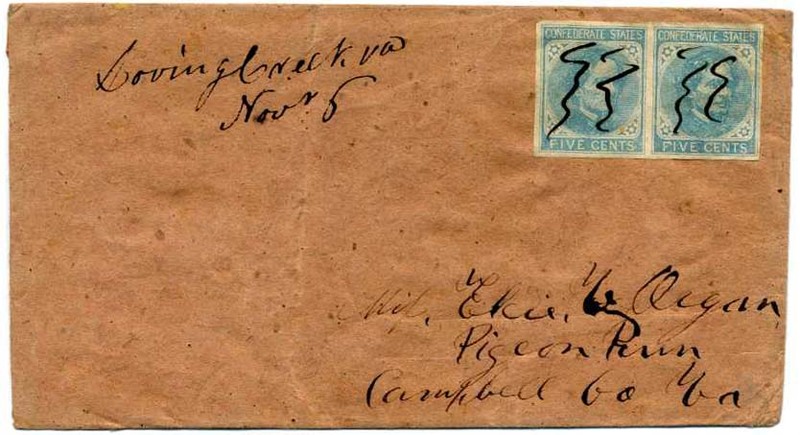 CSA 7, two large 4-margin singles 5¢ blue tied neat together by neat SPARTANBURG / S.C./ APR / 11 double circle cancel on blue commercially made cover to Charleston, Very Fine $150. CSA 7 vertical pair 5¢ blue tied NEW MARKET / VA. cds on cover to New Hope, VA $110. 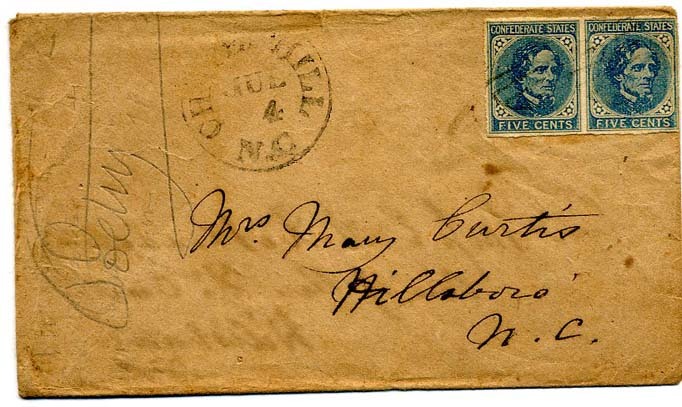 CSA 7, 5¢ blue pair canceled with grid cancels and matching CHAPEL HILL / N.C . // JUL / 4 cds on turned cover to "Mrs. Mary Curtis, Hillsboro, N.C." on turned cover; inside use franked with another pair 5¢ blue tied with indistinct blue cancel and addressed to "Miss E.A. DeRosset Care of Rev. 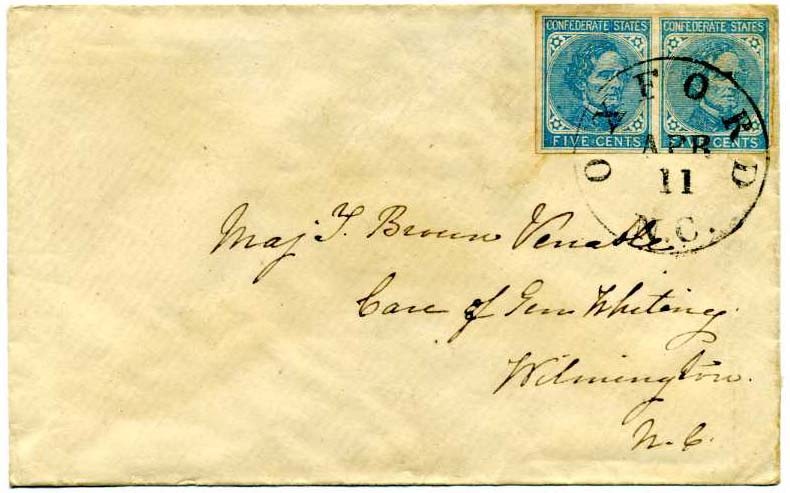 Dr. Curtis, Hillsboro, N.C." This is correspondence between sisters. Mary DeRosset Curtis was married to Episcopal priest Rev. Moses Ashley Curtis who was a preeminent mycologist renowned among botanists even today. Exceptionally nice turned cover. $200. CSA 7, pair of 4-margin 5¢ blue tied green CHESTER C.H. / S.C. cds on fresh cover to Charleston, SC, Very Fine $250. CSA 7, 5¢ blue, horizontal pair, top frame filled in tied by "Milledgeville, Ga" cds and used over ms "Ex(ecutive) Dept." 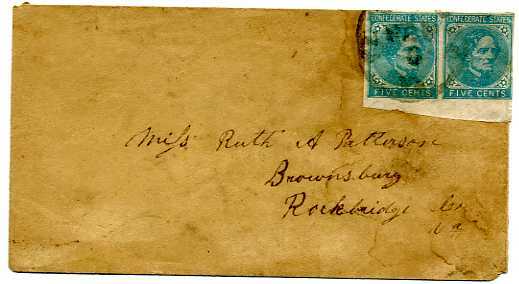 on cover addressed to "Genl Ira R. Foster, Q.M.G., Atlanta, Geo. ", fresh and Very Fine. Ira R. Foster was a native of Cherokee, Ga., and a political and personal acquaintance of Georgia Gov. Joseph Brown for many years prior to the Civil War. A lawyer, physician, and state legislator, Foster had extensive business interests in land, flour- and saw-mills in north-central Georgia and Alabama, and remained active in state politics into the Reconstruction period. During the Civil War years, Foster fulfilled a difficult task as Quartermaster General for the state of Georgia, an office which he continued to fill after the collapse of the Confederacy. In his History of the State of Georgia (New York, 1881) Isaac Avery writes that Foster "exhibited a signal efficiency in the arduous duties." $230. 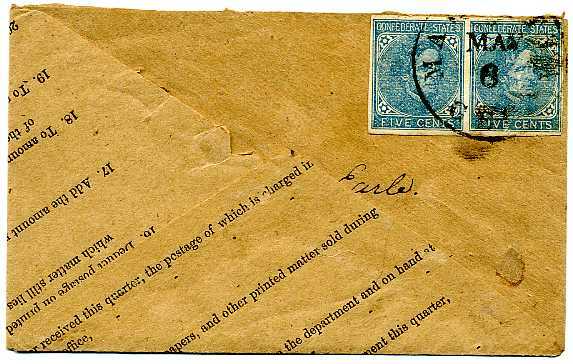 CSA 7, 5¢ blue, horizontal pair (light horizontal crease) tied by "Charleston, S.C. Apr 2" double circle cancel on folded business letter to Adams Run, Very Fine $100. 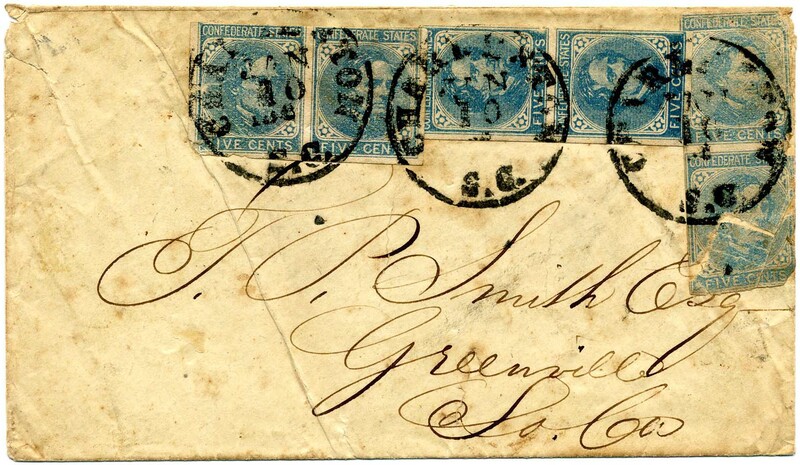 CSA 7, 5¢ blue vertical pair (four margins) tied neat Greenville C.H., S.C Jan 26 cds on pristine blue cover to Flat Rock, Extremely Fine, Ex Wm. A. Fox. $185. 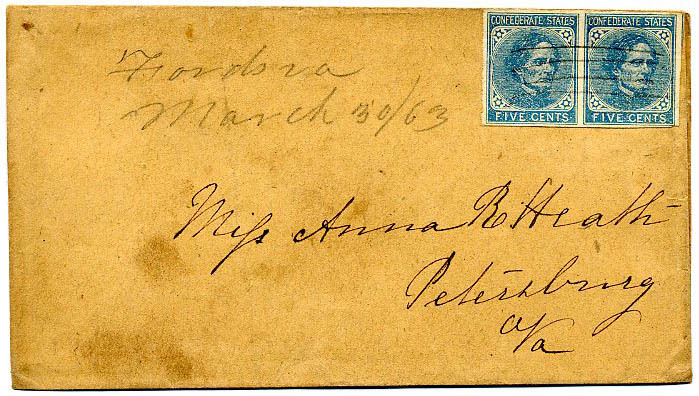 CSA 7, 5¢ blue pair, pen canceled with Fords (Depot), Va March 30 / 63 manuscript postmark on homemade cover addressed to Petersburg, Very Fine, Scarce town near Petersburg. $170. 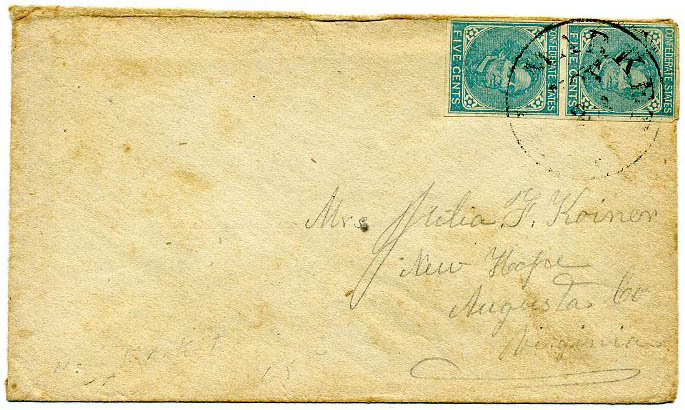 CSA 7, 5¢ blue vertical pair tied MACON / MISS double circle cancel on commercial cover to “Mrs. Henry L. Muldrow, Tibbee Station, M. & O. R.R., Miss. (Mobile & Ohio Railroad)“ with docketing “Columbia Oct 8th 1863”. Detailed bio of the illustrious Muldrow and the 11th Miss. Cavalry included. $150. Henry Lowndes Muldrow (1837-1905) entered the CS Army as a private in 1861 and rose to the rank of Colonel of Cavalry. He commanded a battalion of the 11th Mississippi Cavalry. Much more information on the linked page. 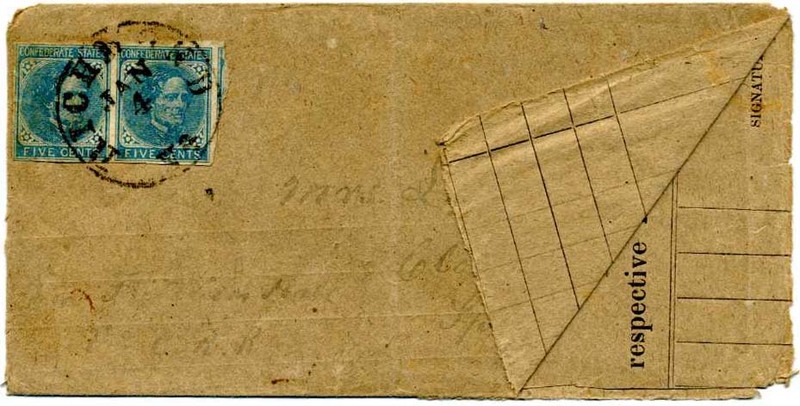 CSA 7, 5¢ blue pair tied MARIETTA / GA cds, small surface scrapes, on adversity cover to Richmond made from Post Office form making repeated mention of postage stamps and postal envelopes $400. CSA 7, 5¢ blue pair with P.O. 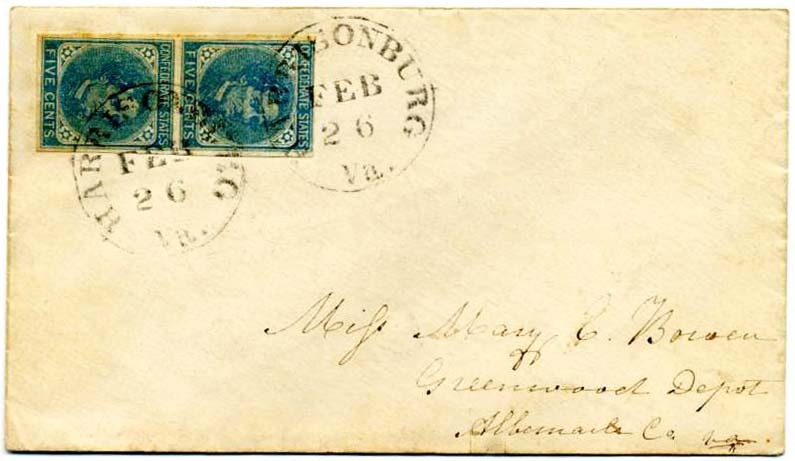 crease between stamps, used with manuscript cancel of “Stevensburg (Va) Feb 28” on homemade cover addressed to “Capt. 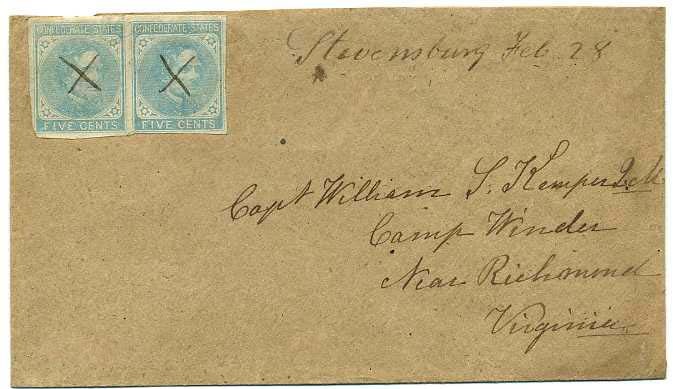 William S. Kemper QM, Camp Winder, Near Richmond, Virginia”, slightly reduced at top. Ex Kohn. $150. 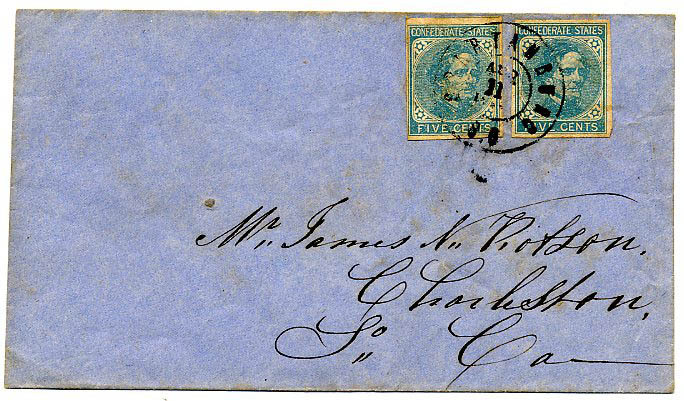 CSA 7, 5¢ blue pair with filled in frame lines, PO crease in gutter, tied light GREENVILLE C.H. / S.C. cds on adversity cover fashioned used ledger sheet, addressed to Haynesville, Georgia, $175. 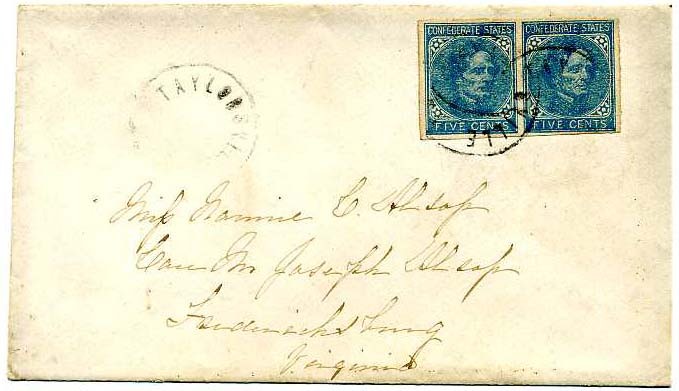 CSA 7, 5¢ blue High-surfactant pair tied double strike of dateless TAYLORSVILLE / VA. cds plus third strike at left on commercially made cover to “Miss Fannie C. Alsop Care Mr. Joseph Alsop Fredericksburg, Virginia”, Ex Tobias. $190. 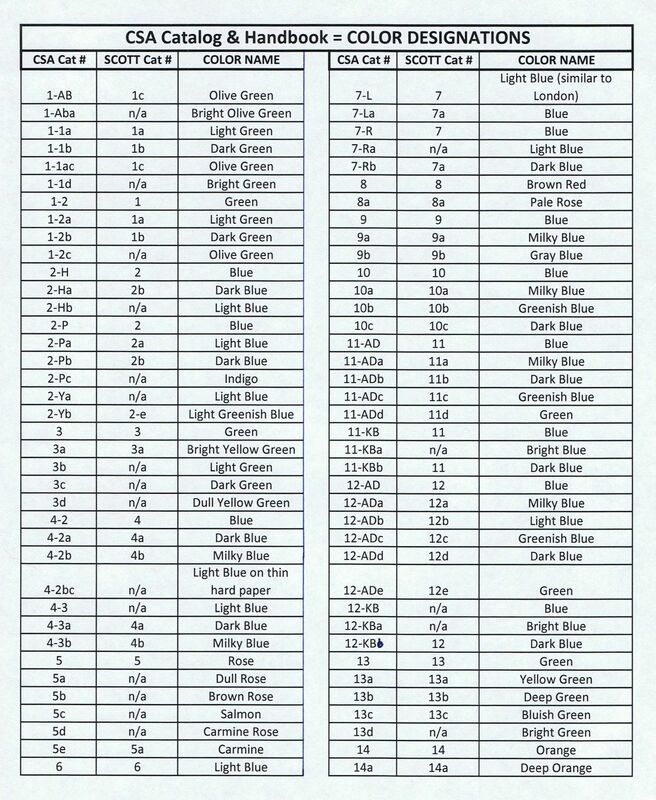 High-surfactant stamps comprise only 11% of CSA 7 stamps tested by Dr. Harry Brittain with FTIR. Much more information on the linked page. CSA 7, 5¢ blue (two faulty singles) tied RICHMOND / Va. cds on homemade cover to “Maj. Mitchell Tate care of Charles Tate Esq, Max Meadows P.O. Wythe Co Va” which was then crossed out and forwarded to “7 Mile Ford Va & T. R.R.” (Virginia and Tennessee Rail Road). In the 2000 census Max Meadows was still a small town with a population of only 512. It was from this area that the important nearby mined lead was taken to be loaded on to railroad cars. It is little recognized that the Wythe County lead mines were of great importance to the southern war effort. Mitchell B. Tate was shown in military records as enlisting as a captain and on CS Gen & Staff. Other indications are that he was from North Carolina; worthy of further research. $250. 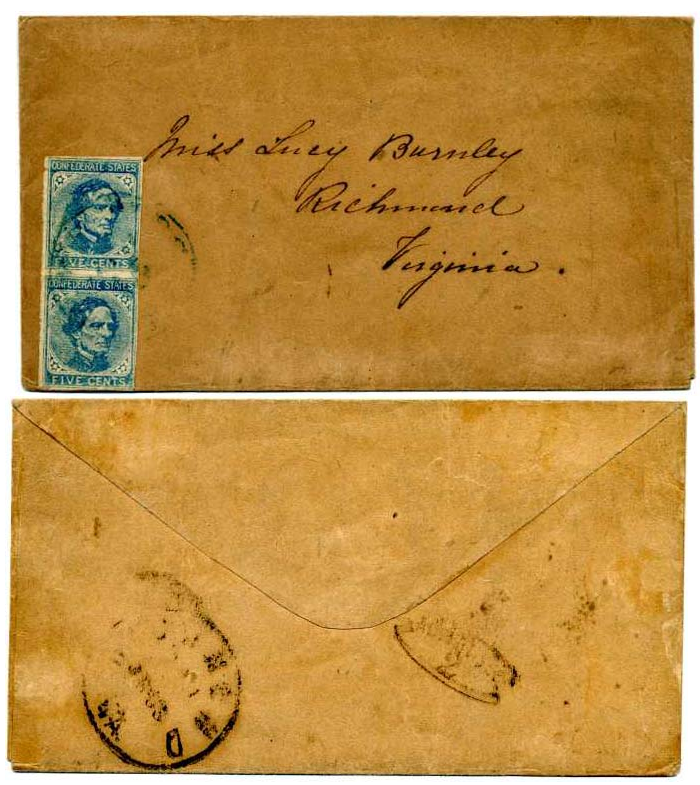 CSA 7, vertical pair of 5¢ blue High-surfactant tied blue PETERSBURG / VA. cds on cover to “Miss Lucy Burnley, Richmond, Virginia” with scarce notched “ADVERTISED 2” and matching RICHMOND / Va. cds on verso. $350. 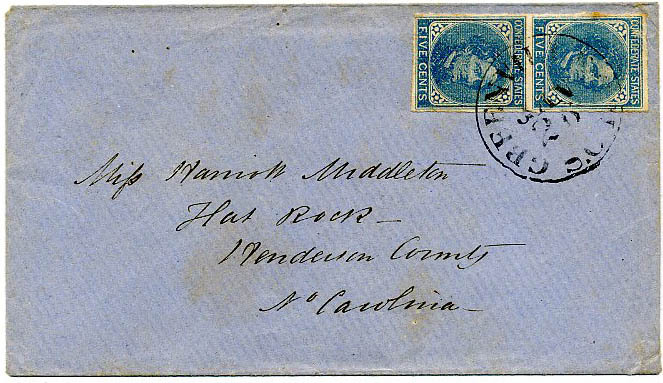 CSA 7, 5¢ blue pair tied neat blue COLUMBIA / S.C. // MAR / 9 cds on exceptionally nice turned cover to “Mr. 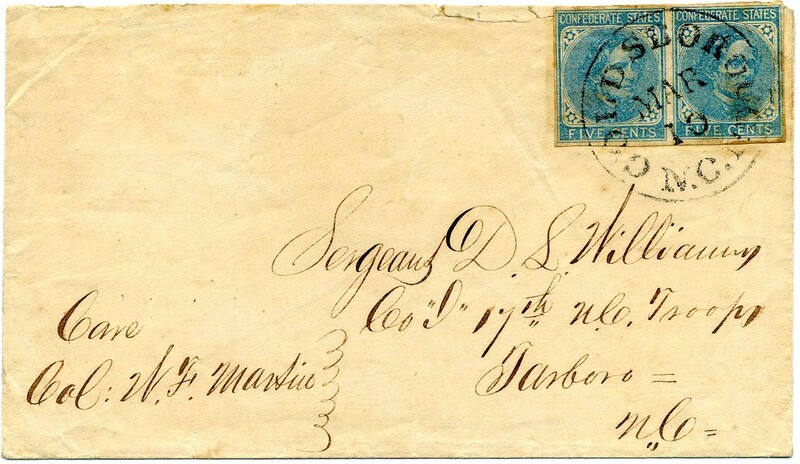 Jas McPhutus, Raleigh, N Ca”; inside is an exceptionally nice CHARLESTON / S.C. / SEP 3 / 1861 handstamped PAID 10 addressed to “Mr. Jno P. Brown, Liberty, Virginia”, Extremely Fine, ex Cantey. Could easily be opened to show other side. $450. 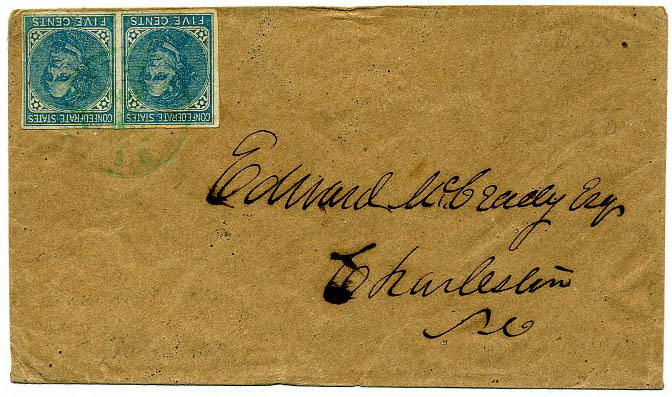 CSA 7, 5¢ blue high-surfactant vertical pair, 4 margins, tied neat bold CHARLESTON / S.C. // NOV / 17 cds on fresh cover to “Rev Prof J M. Schreckluse, Newberry CH, SC”, part of back flap slightly reduced otherwise Extremely Fine $180. 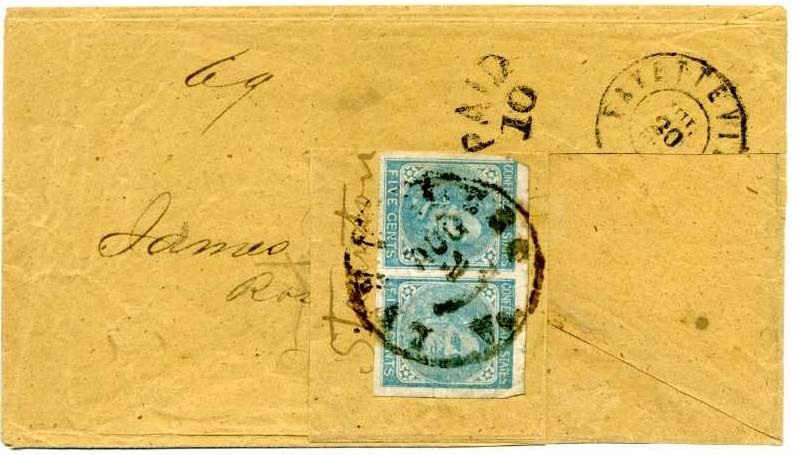 CSA 7, 5¢ blue pair tied by indistinct cds that is likely AUGUSTA / GA. on cover addressed to “Hon. W. W. Clark M.C. (Member of Congress) Richmond, Va”. William White Clark (1819-1883) was a representative to the Confederate Congress from Georgia, as well as a member of Georgia state house of representatives in1841. Docketed on verso “McLaren Sec of State ansd” $150. 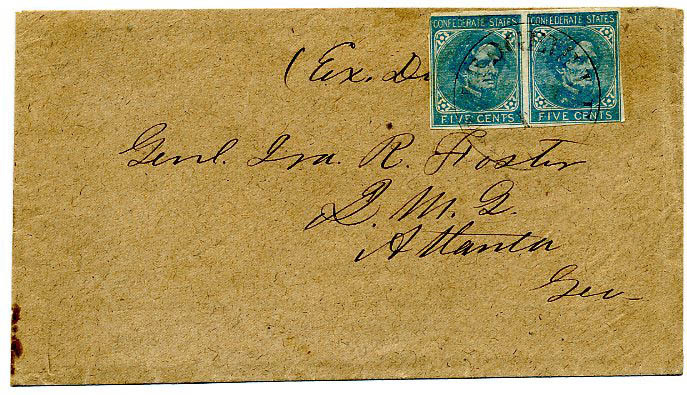 CSA 7, 5¢ blue pair tied by GUINEYS / VA cds on cover addressed to “Hon. W. W. Clark M.C. (Member of Congress) Richmond, Va”. William White Clark (1819-1883) was a representative to the Confederate Congress from Georgia, as well as a member of Georgia State House of Representatives in1841”. Docketed up left side “A.B. Williams Transfer Ansd”. 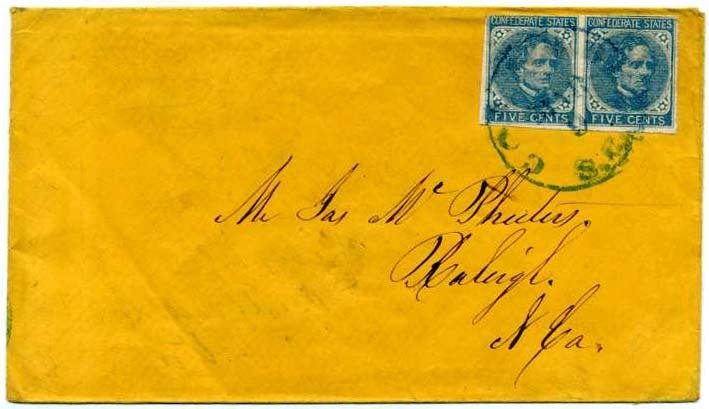 Inside use apparently handcarried, addressed in the same manner to Clark; slightly reduced at bottom and bottom flap missing. $150. CSA 7, 5¢ blue single with small defects, tied by Ten. town cancel and apparently another stamp fell off so assessed with a manuscript “Due 5”, addressed to “Mrs. W. R. Welch, Lomer Peach Tree, Wilcox County, Alabama”, slightly reduced at left. $150. 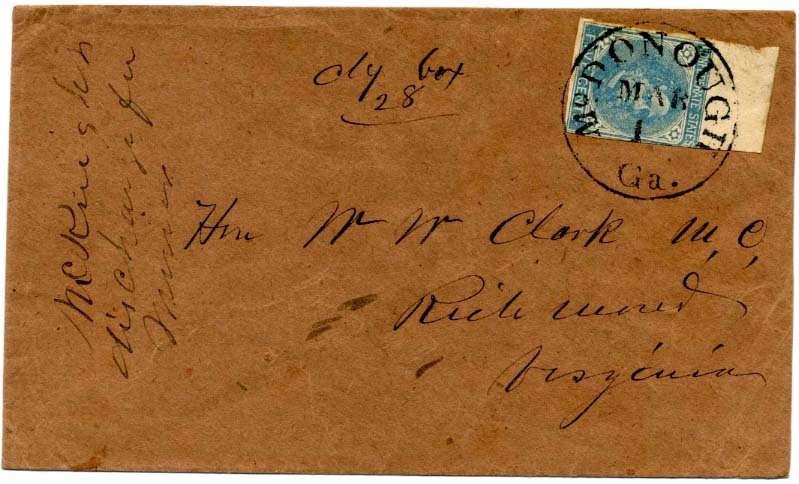 CSA 7, 5¢ blue top sheet margin single tied superb strike of scarce McDONOUGH / Ga. // MAR / 1 cds on homemade cover addressed to Member of Congress “Hon W. W. Clark, M.C., Richmond, Virginia” with docketing up left side “McKnight discharge Minor”. 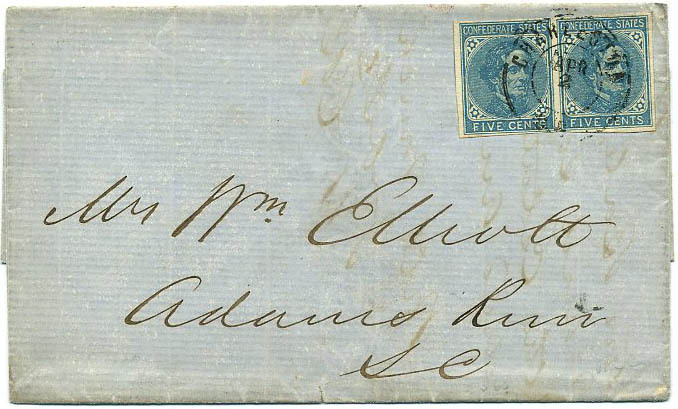 As the earliest known Richmond print is July 1862, this appears to be an underpayment of the 10¢ rate that got through, slightly reduced at right, A lovely and scarce use with great provenance, ex Judd, Oswald and Ballard. $350. 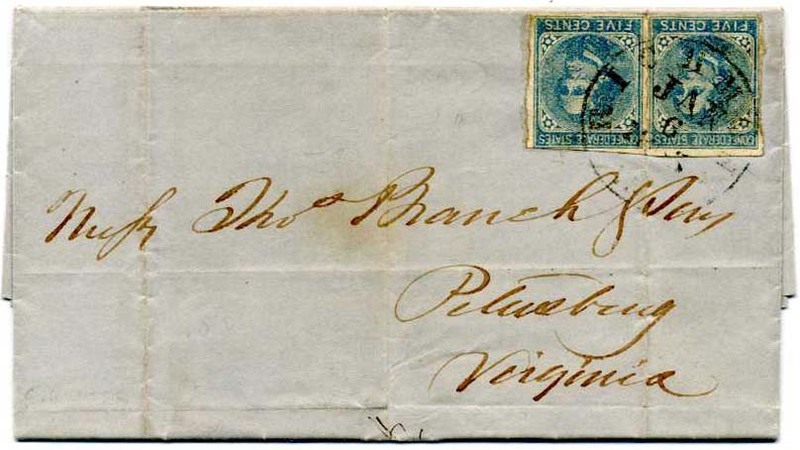 CSA 7, 5¢ blue pair tied RICHMOND / Va. // JAN / 6 cds on 1859 printed circular to Petersburg with Jany 5/63 dated business letter written at the bottom, usual file folds. Could have been sent at 2-cent rate, thus overpaid. $300. CSA 7, 5¢ blue High-surfactant pair tied RICHMOND / Va. // JAN / 4 cds on adversity cover made of printed legal form addressed to “Mrs. Lucy M. Massey, Clover Green PO, Spotsylvania, Co, Va. via Frederick Hall, Va C.R.R.” $300. 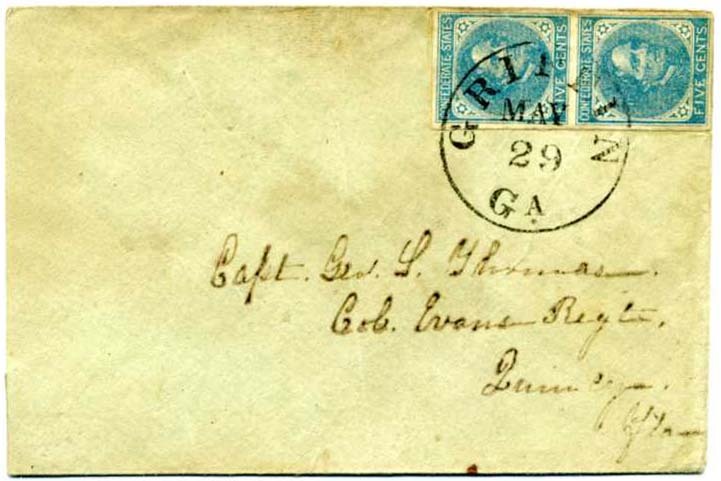 CSA 7, 7¢ blue vertical pair (pre-use crease) tied GRIFFIN / GA. // MAY / 29 cds on pale green cover to “Capt Geo S. Thomas, Col Evans Regt, Quincy, Fla”, bit reduced at left side, Very Fine, Ex-Crouch. Thomas was in Co C of the 64th Georgia Infantry – Army of Northern Virginia, take prisoner at Deep Bottom, Virginia and taken to Ft. Delaware. Ex Crouch. $160. CSA 7, 5¢ blue pair tied double strike of SELMA / ALA cds on cover to “Major General M. Lovell, C.S.A., Jackson, Miss.”, docketed on verso as from “E. M. Lovell, Shelby 23 Aug /62” and “Rec’d 28 Aug /62”, likely in Lovell’s hand. $200. Major General Mansfield Lovell was in command of the defenses of New Orleans. Much more information on the linked page. CSA 7, 5¢ blue pair tied bold clear WARRENTON / GEO. // JUN / 12 cds on clean homemade cover to J. 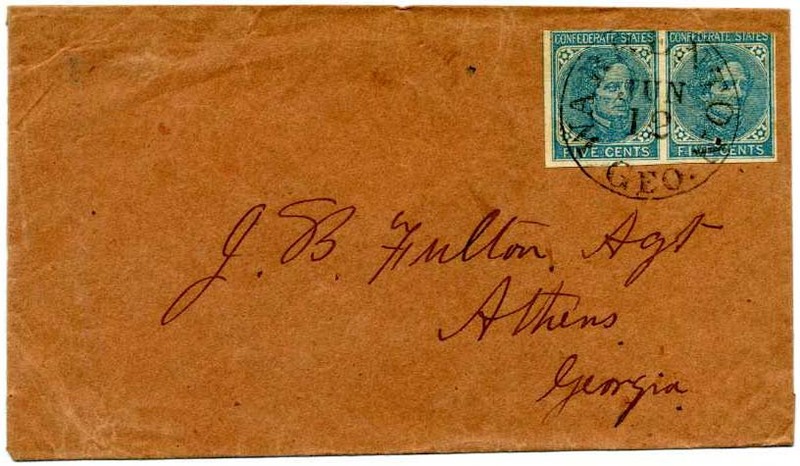 B. Fulton, Agt., Athens, Georgia; part of top back flap missing otherwise Very Fine. $150. CSA 7, 5¢ blue pair tied ORANGE C.H. 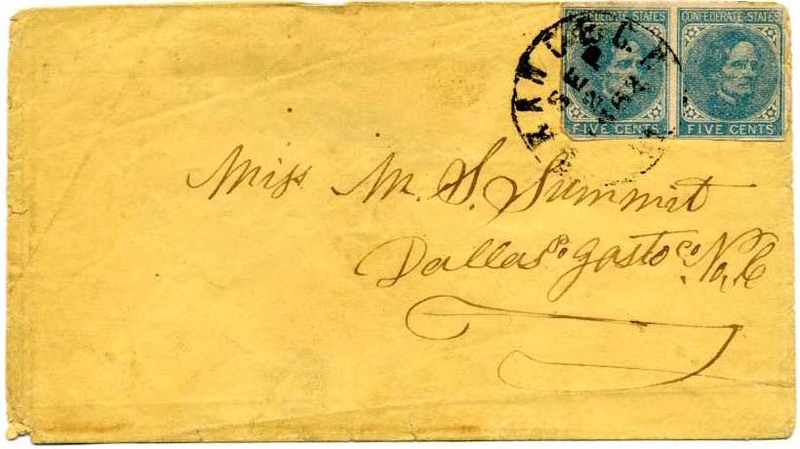 / VA // SEP / 2 / 1862 cds on cover to “Miss M. S. Summit, Dallas PO Gasto[n] Co No C”, flap faults otherwise Fine. $100. 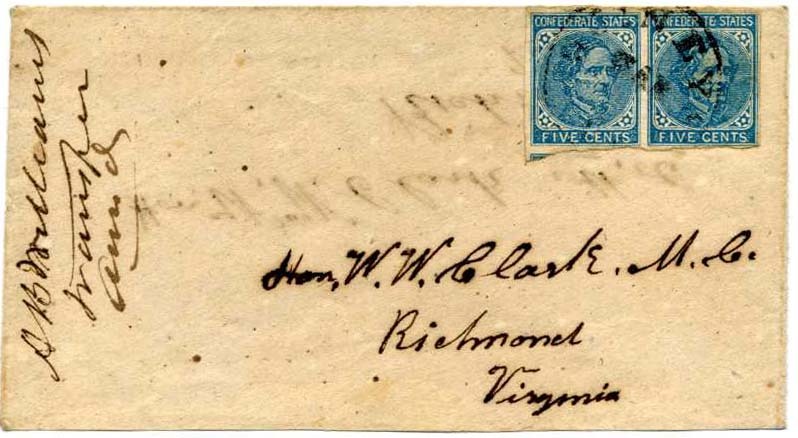 CSA 7, 5¢ blue high-surfactantpair used with manuscript cancel of Loving Creek Va Novr 5 on homemade cover to Miss Elcie Y. Organ, Pigeon Run, Campbell Co Va, Fine obscure small town $200. CSA 7, 5¢ blue – two high-surfactant singles (right with sealed tear), tied neat clear CLARKSVILLE / Va. // APR / 8 cds on homemade cover to Mr. H. Trahm Clay, Roxboro, N.C., Molesworth note on back that these are #6 & 7, but just appear to be different qualities of local prints to my eye $150. 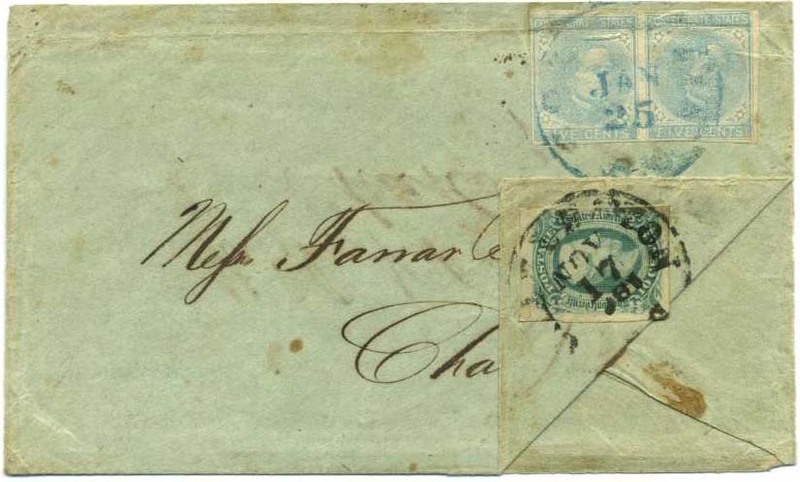 CSA 7, 5¢ blue pair (small faults) tied blue COLUMBIA / S.C. // JAN / 25 cds on pale green turned cover to Messrs Farrar Brother & Co.; inside use #11c, 10¢ greenish blue tied CHARLESTON / S.C. // NOV / 17 and addressed to J. N. Robson, Charlotte, NC, a nice turned use $240. CSA 7, 5¢ blue pair (small faults) with filled in frames at top and right indicating upper right position on the sheet, tied LYNCHBURG / Va. // AUG / 2 cds on inside use of turned cover addressed to Staunton, Va; outside use is FAYETTEVILLE / N.C. // JUL / 30 double circle with matching handstamped PAID 10 addressed to James McGorman, Rose Cottage, Lynchburg, Va,, Nice turned use $350. 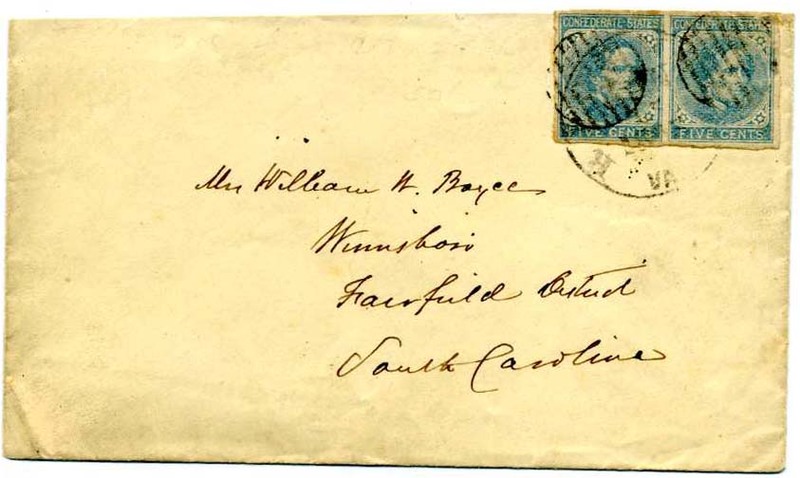 CSA 7, 5¢ blue pair tied RICHMOND / VA cds and Winnsboro receiving grids on cover (top back flap missing) addressed to Mrs. William W. Boyce at that place (wife of CSA Congressman Wm Boyce). 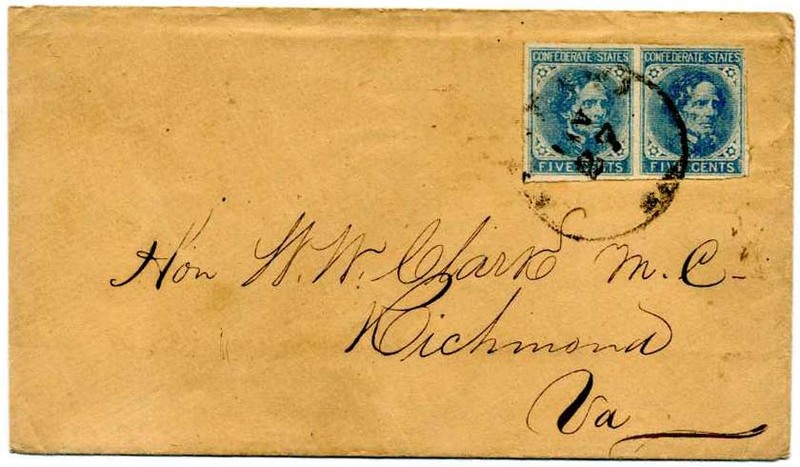 The story is told that early on, the Winnsboro postmaster was reprimanded by the POD Richmond for not adequately canceling the stamps to prevent reuse. Ever thereafter, both incoming and outgoing mail was well obliterated. $150. 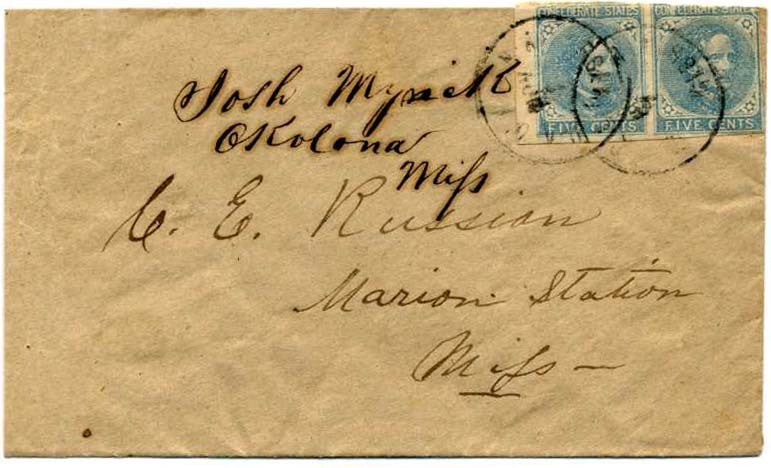 CSA 7, 5¢ blue left sheet margin pair tied double strike of OKOLONA / MISS cds on cover to E. E. Russian, Marion Station, Miss with contemporary contents docketing of “Josh Mynick, Okolona, Miss” $170. 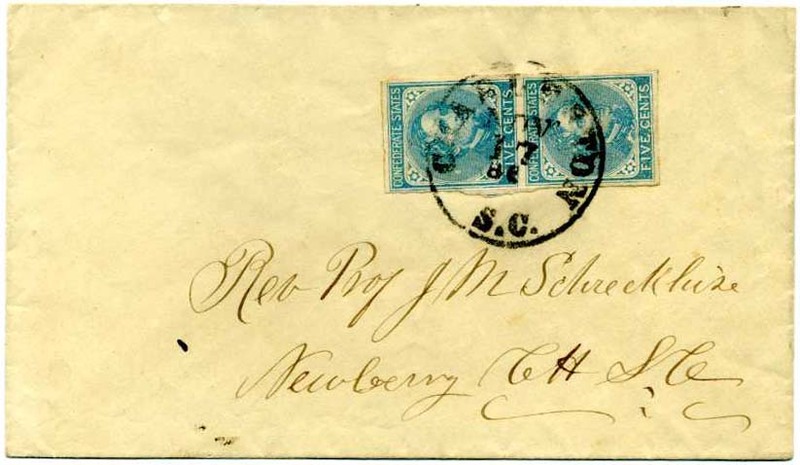 CSA 7, 5¢ blue pair tied neat OXFORD / N.C. // APR / 11 cds on neat cover addressed to “Maj. T. Brown Venable, Care of Gen. Whiting, Wilmington, N.C.” Military records of Thomas Brown Venable and Maj. Gen. William Henry Chase Whiting included. $400. 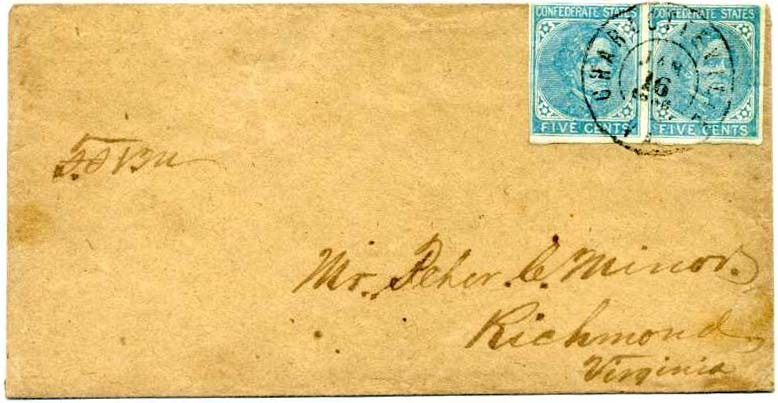 CSA 7, 5¢ blue pair (filled in frame variety on right stamp) tied neat CHARLOTTESVILLE / VA // JAN / 16 / 1863 double circle cancel on neat cover to “Mr. Peter C. Minor, Richmond, Virginia. $125. 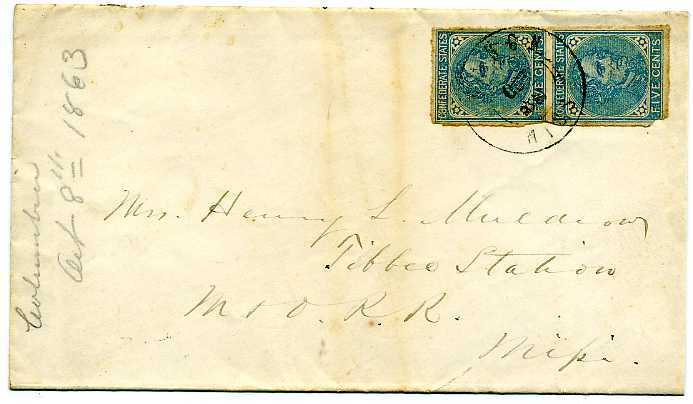 CSA 7, 5¢ blue high-surfactant vertical pair tied double strike of neat HARRISONBURG / Va. // FEB / 26 cds on pristine commercially made cover with watermark of Joynes 1862 on laid paper, addressed to Miss Marry E. Bowen Greenwood Depot, Albemarle Co Va, Extremely Fine. $180. 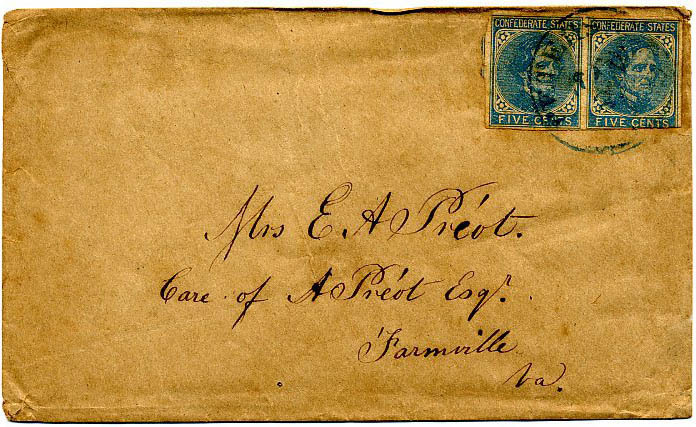 CSA 7, 5¢ blue pair tied blue PETERSBURG / VA. / JAN cds on homemade cover to “Mrs. E. A. Préot Care of A. Préot, Esq., Farmville, Va.” Eduard Arnaud Préot was born in Lille, France, emigrated to the U.S. and served on faculty of several female colleges. He was more illustrious in death than in life. In 1873 a keg of Préot’s beer exploded in his face and killed him. Complete and interesting biography with likeness accompanies. See my column on this correspondence at ASDJUN09.pdf $160. CSA 7-R, 5¢ blue, 3 pairs! 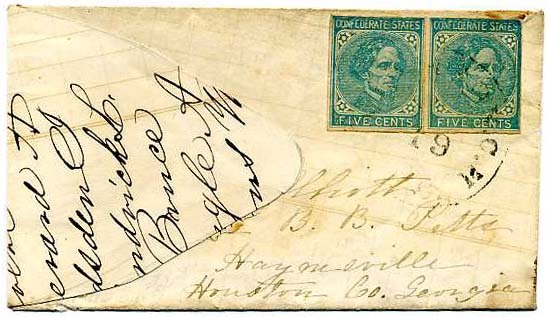 (pre-use faults), tied 3 bold strikes CHARLESTON / S.C. // JAN / 10 / 186_ CDS on cover to T. P. Smith, Esq., Greenville, So Ca., Multiples used to pay overweight letter rates are scarce. Ex Karrer and Fisher. $250. 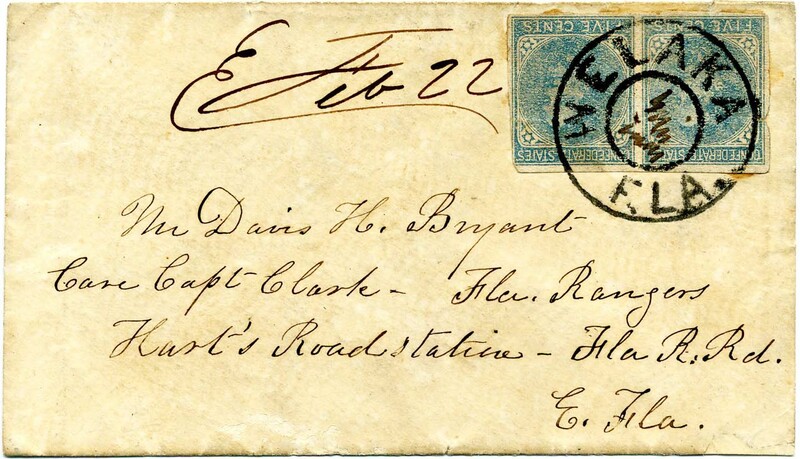 CSA 7-R, 5¢ blue pair (couple tiny edge nicks) tied bold perfectly struck WELAKA / FLA double-circle cancel, ms. “Feb 22,” on small commercially made cover with embossed flap tip, to “Davis H. Bryant, Care Capt. Clark, Fla. Rangers, Hart’s Road Station, Fla R. Rd., E[ast] Fla.” Welaka was a military supply stop on the Florida Railroad. 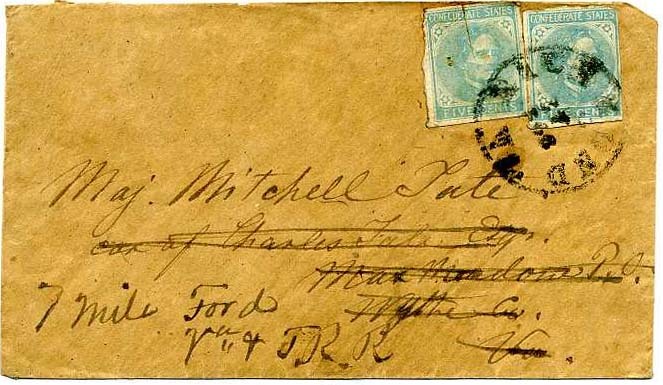 ONE OF THE MOST DRAMATIC POSTMARKS IN THE CONFEDERACY. Extremely Fine Showpiece. 1986 CSA Certificate. $1,200. 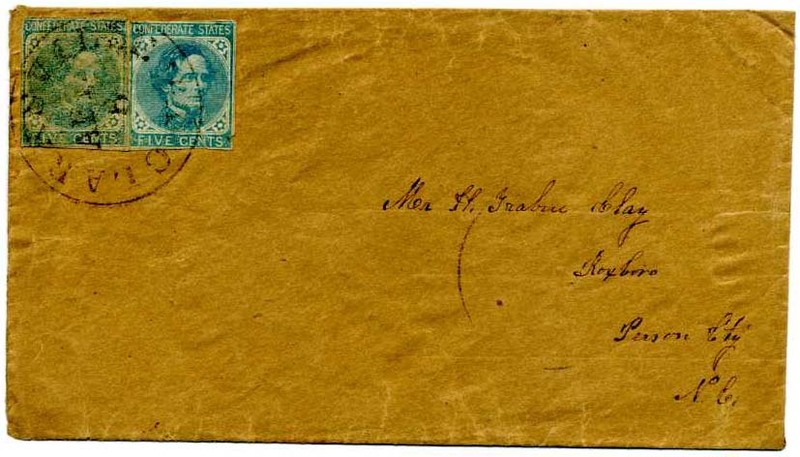 Stephens-Bryant Family Papers are well known to Confederate postal historians. More detailed information on the linked page. 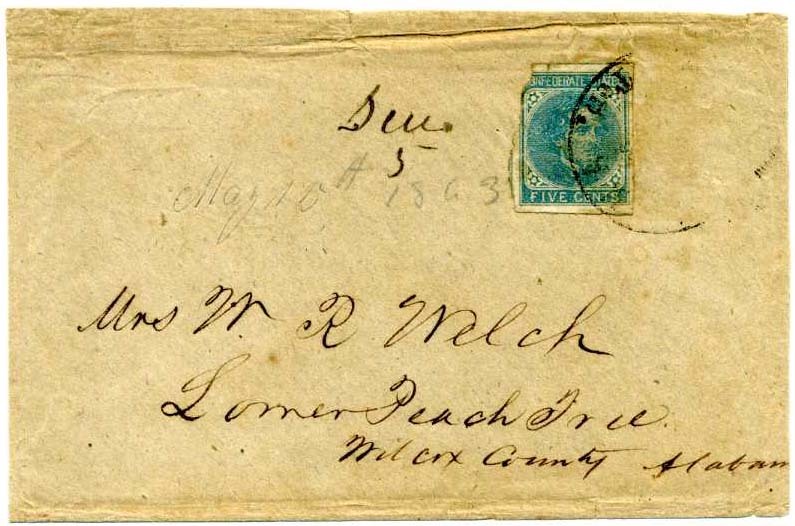 CSA 7-R, 5¢ blue pair (4 margins) tied neat light GOLDSBOROUGH / N.C. // MAR / 15 cds on cover to Sergeant D. L. Williams Co. “I” 17th N.C. Troops, Tarboro, N.C. Care Col. W. F. Martin. Small sealed cover tear at top. David L. Williams was a sergeant in Company I, 17th North Carolina Troops. More detailed biographical information on the linked page.